Tip: Eliminate added sugars from your diet to feel more energized, have less pain and a clearer mind, and avoid chronic disease. In our food environment, we are constantly surrounded by sugar. The 2015-2020 Dietary Guidelines for Americans recommend reducing intake of added sugars to less than 10 percent of total calories, and the American Heart Association recommends no more than 24 grams of added sugar for women and 36 grams for men. Many of us eat more than this in just one sitting! This overconsumption of added sugar drains us of energy and leads to increased inflammation, chronic disease and weight gain. Eliminate this silent killer from your diet to feel energized, have greater mental clarity, decrease your risk of disease, and feel better than you have in years. When you eat sugar, your blood sugar spikes and gives you a temporary burst of energy that soon plummets, leaving you tired and sluggish. 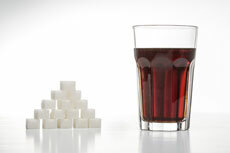 Over time, consuming added sugars increases your risk of heart failure, promotes weight gain and abdominal obesity, and leads to insulin resistance, which is linked with cancer, poor memory and decreased overall cognitive health. Sugar also fuels inflammation in the body – so if you have a cold, body pain or sore muscles, added sugar will make you feel even worse. There are many reasons to avoid sugar, so why do we eat so much of it? Recent research confirms what many of us have suspected – sugar is addictive. In fact, its potency and rapid absorption into the bloodstream make it more addictive than cocaine. Overconsumption dampens our brain’s “pleasure” signal, meaning we need even more sugar to get the same pleasurable feeling. This tolerance leads us to crave sugar and experience withdrawal symptoms when we stop eating it. The only way to break the sugar addiction is to avoid foods with added sugar. Cardiovascular exercise can help us do that, because it “resets” the reward pathway in the brain, lessening our craving for sugar. Once you’ve made the smart choice to avoid added sugars, you will need to learn where they hide in your food. Sugar is not only added to sweet treats, but also to many other foods, including salad dressing, tomato sauce, bread, cured meats and fat-free foods. Become a sugar sleuth and seek it out in the ingredients lists of the foods you eat. Sugar goes by many names, including anything ending in “-ose” (sucrose, fructose, etc. ), cane juice, corn syrup, barley malt and brown rice syrup. Familiarize yourself with sugar’s many aliases to identify which foods contain it and which do not. Hint: around 80 percent of processed foods contain some form of added sugar! Eliminating added sugars from your diet may seem challenging, but the way you will feel when you reduce your sugar intake will surpass the fleeting bliss of any sugar high. Try avoiding added sugars for a few weeks and notice the difference. Not only will you be energized, clear-headed, have less pain, and likely lose a few pounds, but you will also be steering yourself away from future chronic diseases, inflammation and obesity.